Tired of long hanging ear lobes? Can't wear heavy earrings? With a short in office procedure with minimal downtime we can reduce the size of your earlobes with no downtime. Before and after injection rhinoplasty / liquid rhinoplasty with Restylane in the office which took under 5 minutes and improved her nasal profile. 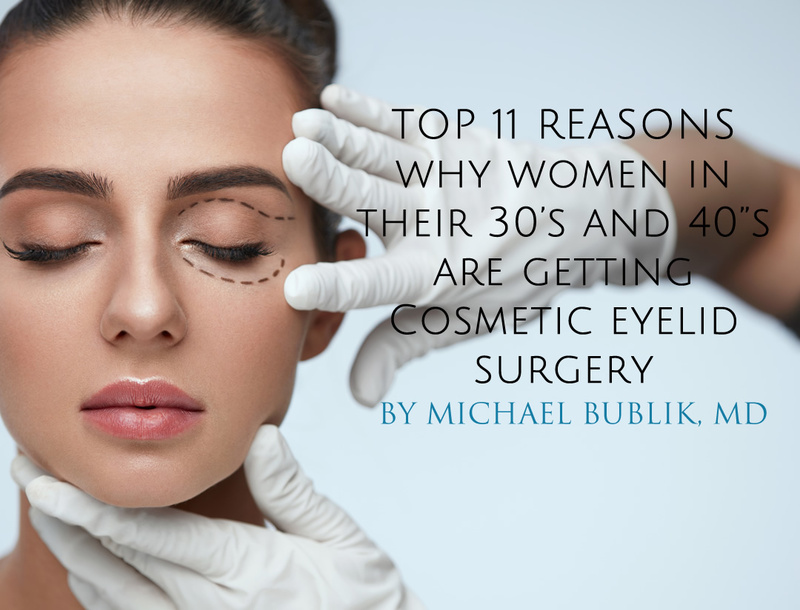 Dr. Michael Bublik, a Board-Certified Plastic Surgeon in Los Angeles, has noticed a significant increase in his busy practice of patients in their 30s and 40s considering plastic surgery (Blepharoplasty) to reduce bagginess from lower eyelids, remove excess skin and fat from the upper eyelids and for greater definition of the upper eyelid crease. TOP 11 Reasons for Eyelid Surgery? Forget duck lips and frozen foreheads, there’s a new ‘au naturel’ look in town termed ‘Baby Botox‘. Dr. Michael Bublik, a Board-Certified Plastic Surgeon in Los Angeles, has noticed a significant increase in his busy practice of patients in their 20s and 30s seeking “Baby Botox” treatments. 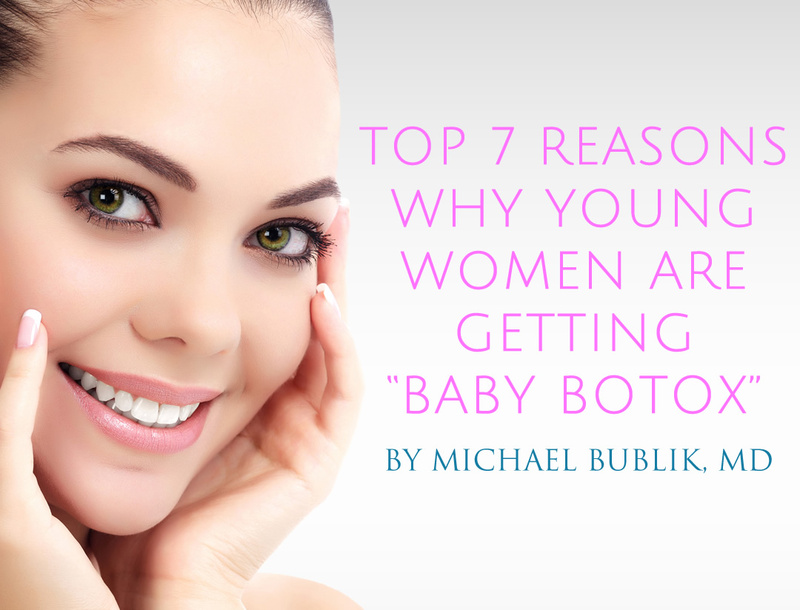 TOP 7 Reasons Why Young Women are Getting Baby BOTOX? Dr. Bublik offers his top 5 tips to help you avoid a poor outcome when looking for the beauty-enhancing benefits of Botulinum toxin type injections. It’s not surprising that Botox and related products have become so popular; when properly injected by an experienced and licensed professional like Dr. Michael Bublik, frown lines and wrinkles are attenuated, and the resulting look is of someone who has returned from a relaxing vacation at a luxurious resort. However, when Botulinum toxin type A injections are administered by inexperienced or untrained providers, the outcome can be scary. 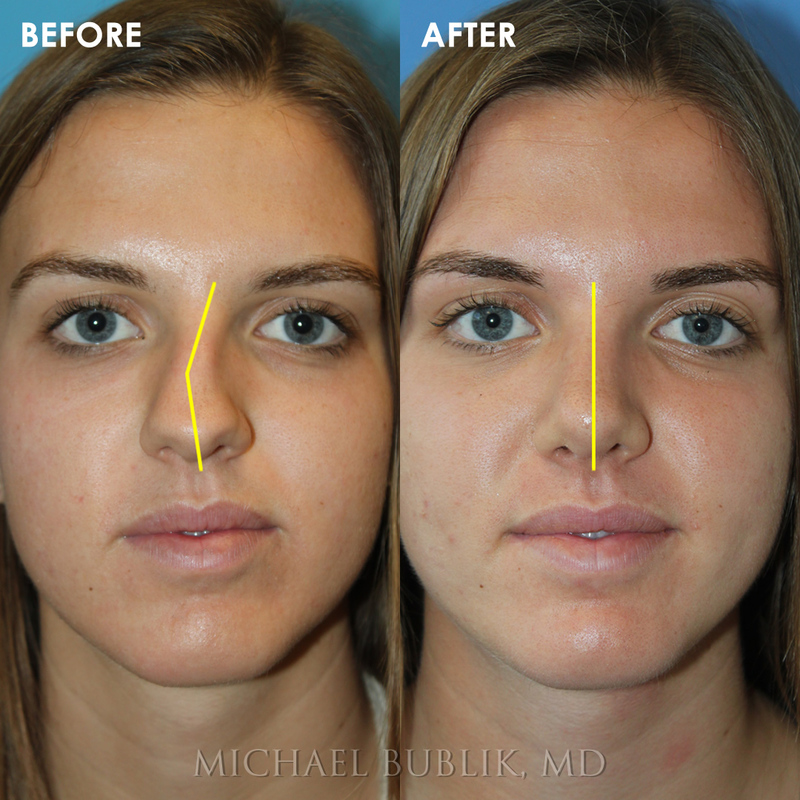 Dr. Bublik is considered by many to be a leading expert in facial fillers. Dr. Bublik trained with the world leaders in facial rejuvenation which included oculoplastic surgeons, facial plastic surgeons, plastic surgeons and dermatologists. As a master injector and facial plastic surgeon, Dr. Bublik customizes each treatment individually. This often includes a combination of different fillers and techniques in order to achieve optimal and natural looking outcomes. Are you unhappy with your dark circles, hollowness or sagging under your eyes? Under eye circles caused by tear trough deformity is described as deep under eye shadow that looks like dark circles under the eyes. People with sagging, dark circles, or hollowness tend to look more tired and older than they are. What is the Complete Nose (Rhinoplasty)? 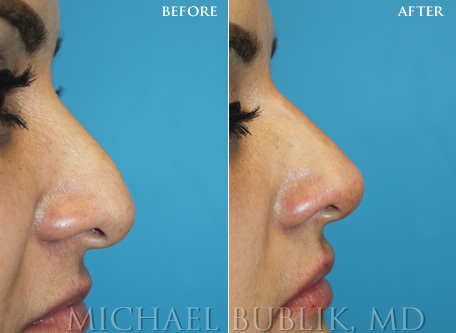 Nasal Surgery or Rhinoplasty (“nose job”) is the precise surgical alteration of the nose to change its overall shape and/or improve or maintain its function. Clinical history: Patient underwent nose reshaping ("rhinoplasty") for a severely deviated crooked nose and septum and nasal hump. She now has a straight side and front profile and is able to breath well through a natural feminine appearing nose. 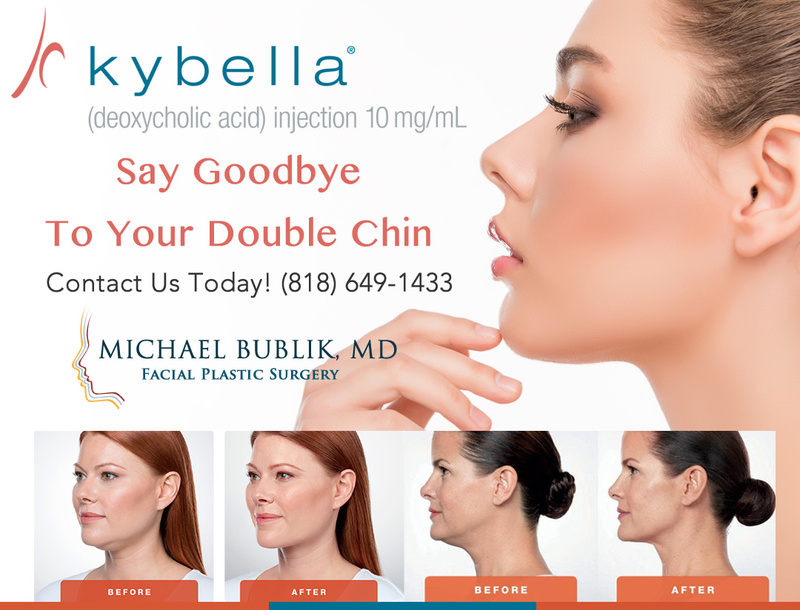 KYBELLA® is a prescription medicine used in adults to improve the appearance and profile of moderate to severe fat below the chin (submental fat), also called, “double chin.” It is not known if KYBELLA® is safe and effective in children less than 18 years of age. Dr. Bublik's practices are conveniently located in Beverly Hills and Glendale CA. We are currently accepting new patients and encourage you to schedule a consultation and discuss your goals with Dr. Bublik. Many people have difficulty breathing through the nose. Although inflammatory problems such as sinusitis, or nasal allergies can cause some of this, structural problems in the nose may also contribute. 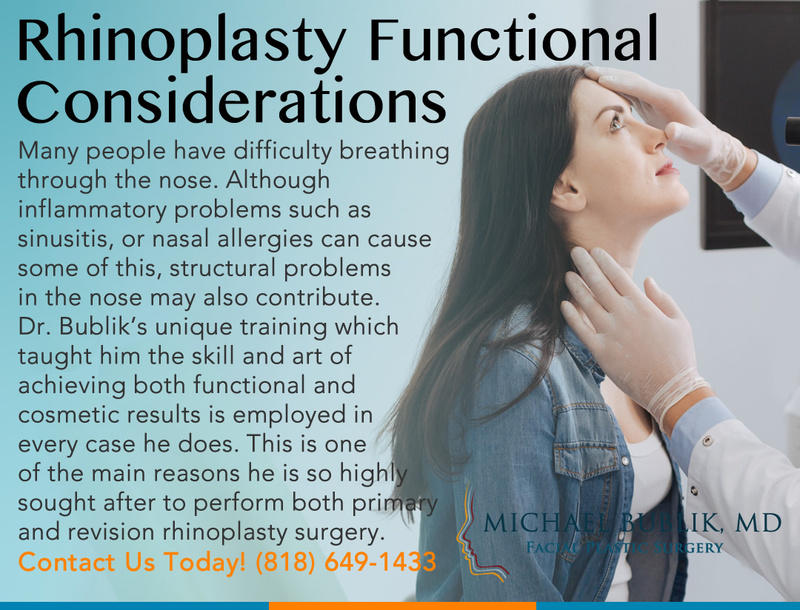 Many patients therefore consider undergoing rhinoplasty not only for cosmetic reasons, but also for nasal breathing and function. 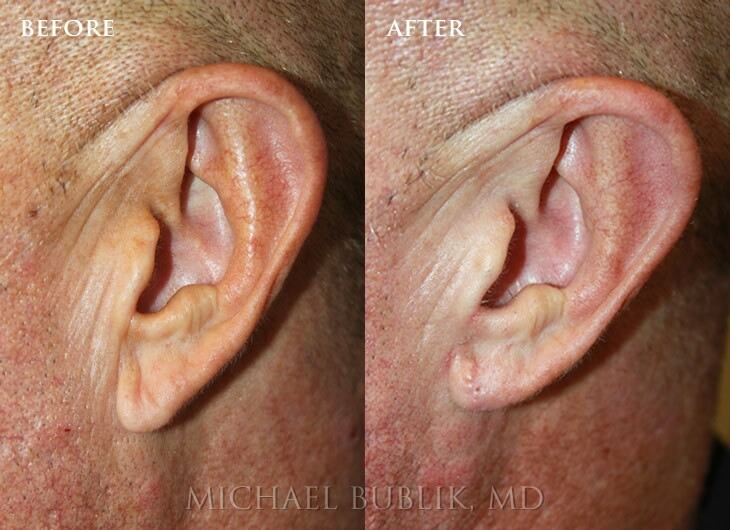 Dr. Bublik’s unique training which taught him the skill and art of achieving both functional and cosmetic results is employed in every case he does. 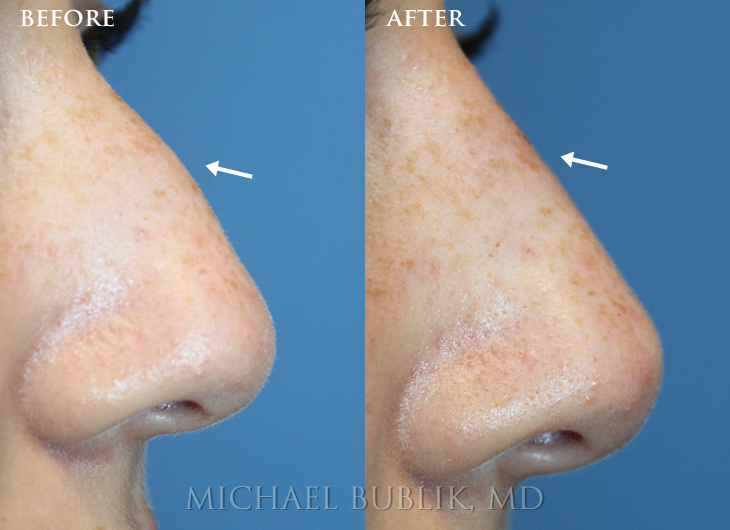 This is one of the main reasons he is so highly sought after to perform both primary and revision rhinoplasty surgery. Swollen nasal passages and the build-up of mucus cause congestion. Swollen and inflamed tissues can also cause pressure on nerve endings around your sinuses and facial area. This leads to dull or throbbing pain and aches around the face, mostly above the eyes, below the eyes and in the back of the head. 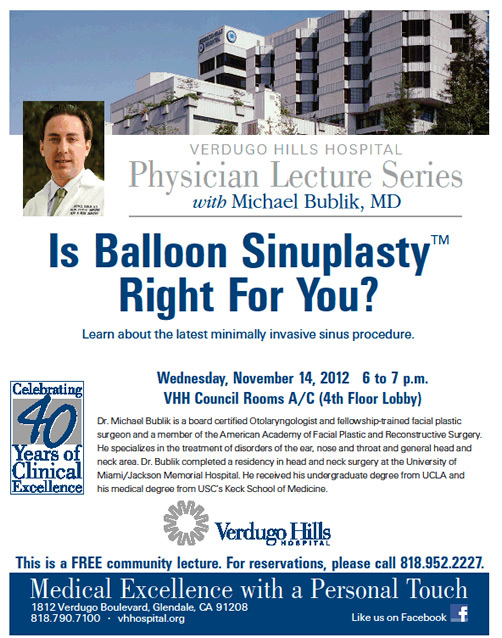 Dr. Bublik in an expert in performing the non-surgical Rhinoplasty using facial fillers. This can be done in the office under 5 minutes with no bruising and walk out of the office with a beautiful new nose. The nose job, or rhinoplasty, is the most common cosmetic surgery done in teens. As of 2012, the American Society of Plastic Surgery (ASPS) indicated that plastic surgery among the young is on the rise with the number of teenage clients receiving treatments today at more than five times the number it was fifteen years ago. Click here to read the full article, "Should Teen’s Get Nose Jobs?" 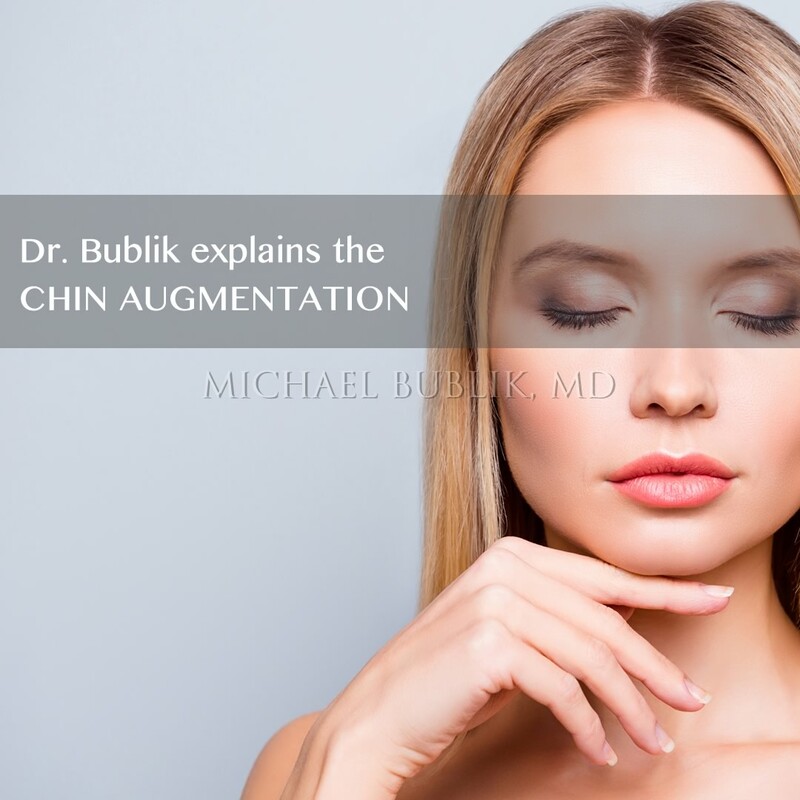 Dr. Michael Bublik, a double board certified physician in Facial Plastic Surgery and Ear, Nose, Throat Surgery, explains that facial aging is a multifactorial, 3D process with anatomic, biochemical, and genetic variables. Exposure to the sun, alcohol use, smoking, body mass index, medications, use of drugs, and other elements, contribute to facial aging changes. Everyone ages differently. Some individuals manage to maintain their youthful good looks with minimal skin looseness, droopiness and sagging well into their 50s, while others are not so lucky. Click here to read the full article "Face-Lift Everyone Ages Differently"
Is it possible to develop an allergy as an Adult? An allergy occurs when an otherwise harmless substance gets flagged as dangerous by the immune system, which then launches an attack. Common allergens include pet dander, pollen, grass, mold spores, dust mites and certain proteins found in foods. The symptoms can arise such as itchy eyes, runny nose and sneezing — are the result of your immune system ramping up to evict the perceived intruders. Although adult-onset allergies are very common and can cause sinus headaches, nasal congestion, and overall lack of energy and a feeling of being sick. It can also lead to sinus infections, shortness of breath and can make asthma worse. The good news is that a simple test in our office can diagnose the cause of the allergy and we have a variety of state of the art treatment options available. Read Full Article on What is Sinusitis? Joining us in the KCAL9 studios on Sunday morning Ear, Nose and Throat Specialist and Facial Plastic Surgeon Dr. Michael Bublik with some answers to the most common questions about allergies. 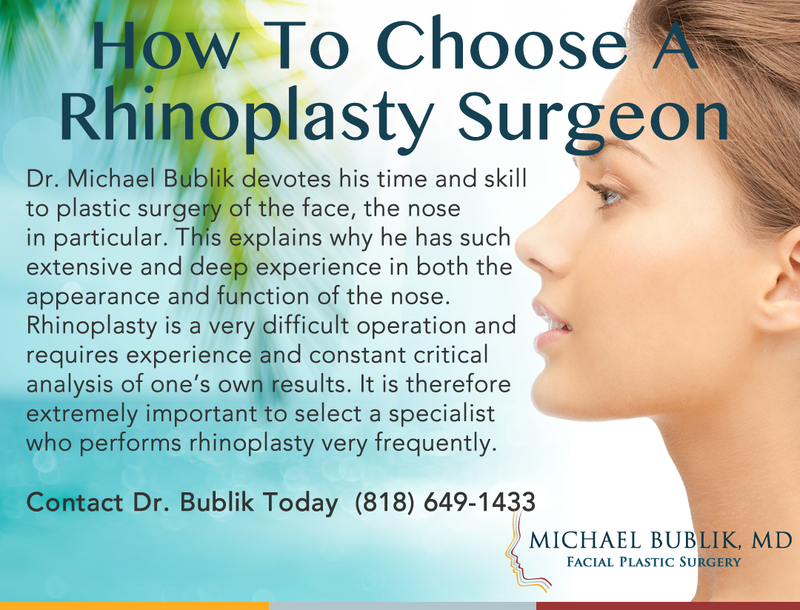 In an effort to upgrade his web presence and to serve the growing “mobile” needs of his Internet using Los Angeles plastic surgery and sinus patients, referring physicians, and local LA communities, Dr. Michael Bublik has launched a new Plastic Surgery, ENT, and Sinus care website. Dr. Michael Bublik is offering his services in Beverly Hills, California on Mondays starting June 8th, 2015 from 1pm - 5pm. Rhinoplasty: The Experts Reference is a comprehensive text that provides guidance from world-renowned experts on every aspect of rhinoplasty, from the functional to the cosmetic. The book opens with a section on initial patient assessment and consultation, moves on to such topics as surgery of the septum, with separate sections on the nuances of functional nasal surgery and revision rhinoplasty, and concludes with a section on avoiding and managing surgical complications. Each chapter is written by an expert on a specific topic and presents tried-and-true rhinoplasty techniques that can be readily implemented by facial plastic surgeons. At the practice of Michael Bublik, MD, the staff is committed to working closely with patients towards their well-being, ensuring personalized attention and the highest standards of patient care.Dr. Michael Bublik, a board certified physician in Facial Plastic Surgery and Ear, Nose, Throat Surgery, has noticed a significant increase of male patients seeking his expertise to improve their looks. While Dr. Bublik has performed plastic surgery and non-surgical cosmetic procedures on various male celebrities, he’s quick to note that most of his male patients are average men. According to the American Society of Plastic Surgeons, since 1997, men’s cosmetic procedures have increased 106%. The top five cosmetic surgeries for men are liposuction, rhinoplasty (nose jobs), eyelid surgery, gynecomastia (removal of excess breast tissue) and ear reshaping. Click here to read the full article "Better Looking Men Have a Competitive Edge"
Click here to read the full article "Baby Boomers Take the BOTOX Plunge"
When choosing between spending on designer shoes and getting a more attractive and rested appearance, women are opting for the latter. 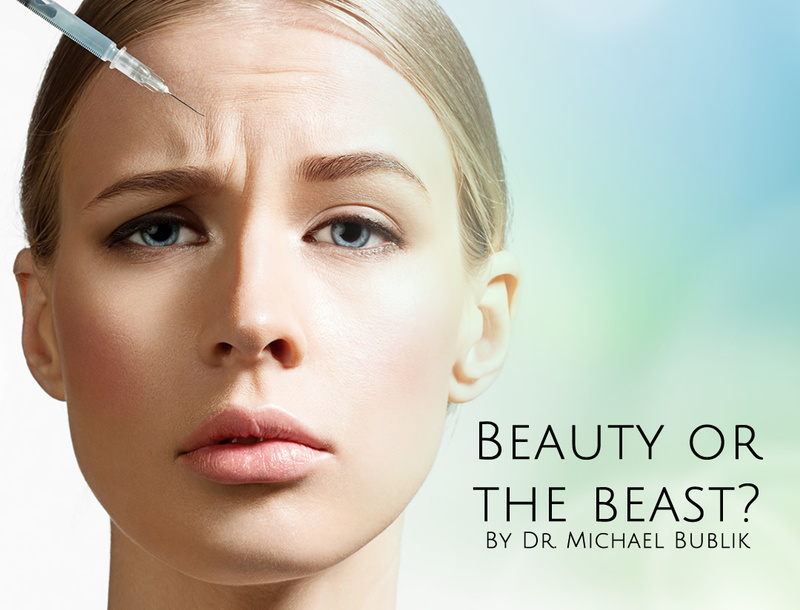 Dr. Michael Bublik, a double board certified physician in Facial Plastic Surgery and Ear, Nose, Throat Surgery, is fond to say that many of his patients consider the cost of injectable dermal fillers and Botox a much better return on investment than buying new designer clothes or jewelry. While many of his patients in their 30s and 40s wouldn’t necessarily consider a facelift, they see their regular visits to Dr. Bublik for fillers and a touch of Botox as part of their regular beauty regime, much as they do haircuts, waxing and facials. And Dr. Bublik is candid in saying that not all of his patients are high powered executives or celebrities, but regular women who know that a fancy new purse or watch can’t bring them the satisfaction of looking in the mirror and seeing a fresher and more attractive version of themselves. 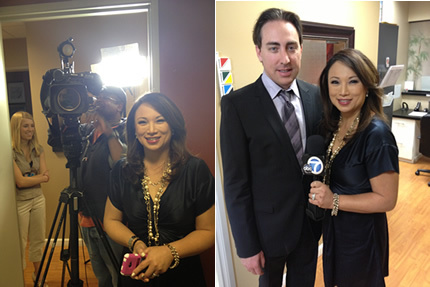 Click here to read the full article "Turn Back the Clock with Botox and Dermal Fillers"
Dr. Bublik was interviewed by Channel 7 News the segment will air tonight January 18, 2012 on ABC Channel 7 Local News in Los Angeles at 4pm and throughout the weekend. Local flu cases double, but another virus is spreading faster. 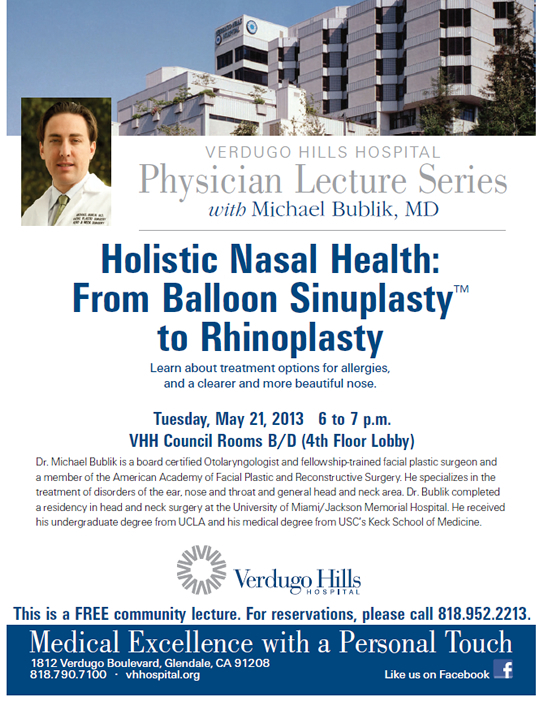 Dr. Michael Bublik will be on CBS KCAL9 News at 8:30am on Sunday Morning 6/3/2012 talking about Nasal Symptoms and Allergies in Los Angeles. This is a FREE community Lecture. For reservations, please call (818) 952-2227. 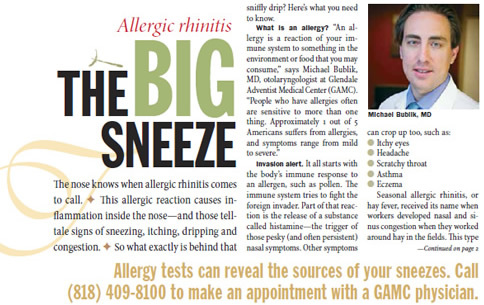 4/23/2012 - Dr. Bublik KFWB News Radio interview regarding allergies. Click play below to listen.